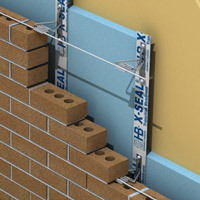 The X-SEAL Anchor meets or exceeds requirements of the Commonwealth of Massachusetts State Building Code for air leakage and water penetration. 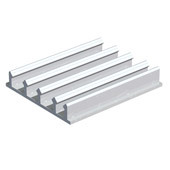 The Seismiclip® Interlock System (S.I.S.) 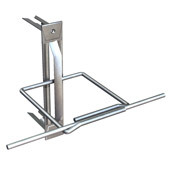 accepts continuous wire in the brick veneer for seismic zone usage. 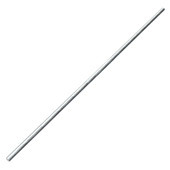 Continuous wire is also beneficial for crack prevention due to thermal expansion and contraction, and aids in the even distribution of positive loads. 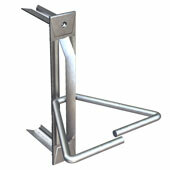 The X-SEAL® Veneer Anchor is packed with more features than any other anchor on the market. 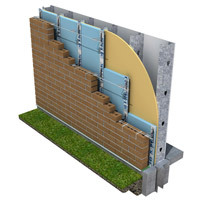 Owners, architects and masons can be confident in the performance of an "X-SEALED" metal stud / veneer wall. 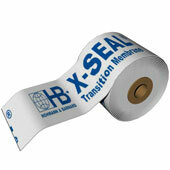 The X-SEAL™ Anchor is the next generation veneer anchor from H&B. 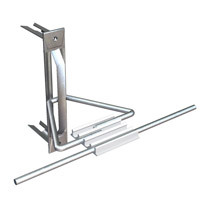 The X-SEAL Anchor improves upon the DW-10-X by moving the horizontal pronged legs in from each end, enabling the backplate portion of the anchor to effectively seal the wallboard /insulation. This helps to maintain the integrity of the vapor barrier and prevents the ingress of air and moisture through the sheathing. The pronged legs are now also rib-stiffened and oriented closer to each other than on the original DW-10-X, thus enhancing the compressive strength BY OVER 20%!